Sea Princess, docked in Victoria B.C. 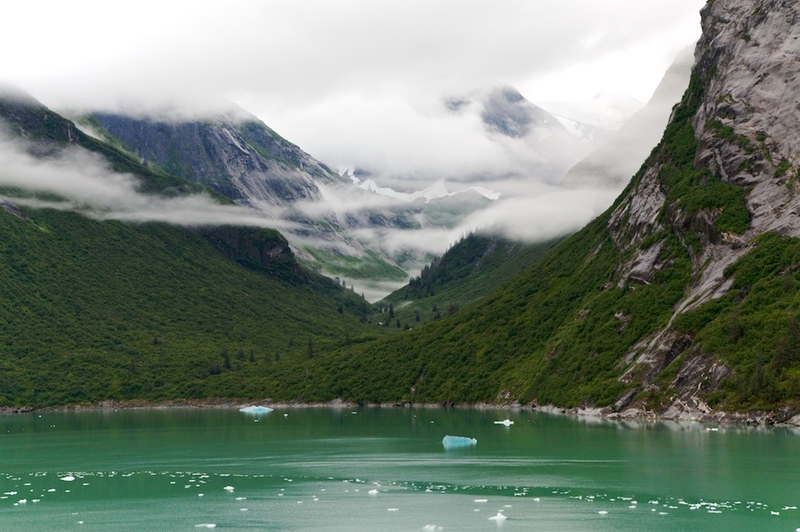 Dyea, Alaska. Those lumps in the water are salmon jumping. We had a wonderful vacation aboard the Sea Princess. We traveled round-trip from San Francisco, stopping in Victoria B.C., then Ketchikan, Juneau and Skagway, Alaska. We saw whales, bald eagles, and a grizzly bear. We panned for gold and rode a sled pulled by a team of dogs that included Iditarod veterans. We ate a lot. This was my fourth time cruising to Alaska. I highly recommend Princess Cruises and the Inside Passage in general. I've never brought crafting supplies with me on a cruise. Taking scrapbook stuff is out of the question- I'd need too many things, I wouldn't have space to work, and I'd risk damaging my supplies. But taking a different sort of small project sounded doable. For months, I've been wanting to try drawing a mandala. Mandalas are basically abstract designs based on a series of concentric circles. Drawing them is supposed to be relaxing- sort of an organized, calming form of doodling. All you need is paper, a ruler, and a compass. That would be simple to fit in my luggage. And since I wasn't flying, I didn't have to worry that the TSA would consider my compass a lethal weapon. I carried my supplies with me pretty much the entire cruise, so whenever I had a few minutes, I pulled out my stuff. The first step to making a mandala is to use the ruler to find the center of the paper. Then use the compass to draw a series of concentric circles. There's no rhyme or reason to this- do as many as you want, as close together as you want. I have to admit, drawing the mandala was not as relaxing as I'd hoped. I was trying too hard to create something pretty instead of just doodling mindlessly. Coloring it was very relaxing though. I ended up making two more mandalas. These were much more relaxing. I think that, just like anything, it takes practice before it is familiar enough to be relaxing. Have any of you tried mandala? Any other suggestions for staying creative while on vacation?